I am a big fan of the whole pinto beans you get in a good Mexican Restaurant. I like them more than the refried beans and they’re actually healthier, because refried beans are fried with FAT – which makes them tasty – but not necessarily healthy. I got an Instant Pot (actually it’s a Cuisinart Pressure Cooker) and I was anxious to try to recreate my favorite beans. These are excellent – and really flexible. I put them in my Oven Baked Tacos Recipe, we eat them alone, you could “refry” them if you like – and for sure you can freeze them when you make too much! I’m not exactly sure what makes these “Charro Style” but the recipe I adapted was a Slow Cooker Charro Beans recipe. The only thing I left out was the tomatoes, which just didn’t go with what I wanted to accomplish. Hopefully these tickle your tastebuds as well! 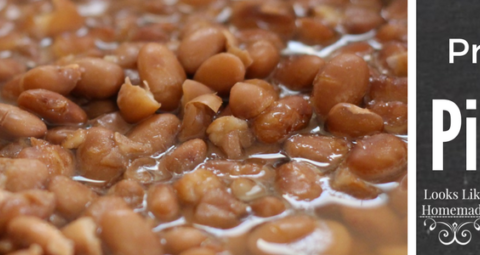 Tasty pinto bean recipe that are great on their own or as in another recipe. Beans are the perfect "instant pot" food! Give this recipe a try! While bacon is browning, rinse your dry beans and pick through for any stones or other smutz you might find. When bacon is crispy, drain and reserve 1-2 Tbsp of your bacon fat, add it back to the instant pot and saute the onions in the bacon fat (or use olive oil if you're health conscious). When onions are soft, add back in the bacon then addin the pinto beans, water, stock, garlic, seasoning, green chiles. Place lid and set to high pressure and 45 minutes. When done, let pressure come off naturally - this will likely take about half an hour. Be patient - if you do a quick pressure release, you'll likely end up with some tough beans. When you can remove the lid, sample and then salt and pepper to your taste. Hi. In your list of ingredients onions are not listed, however, they are listed in the directions. How much onion is there supposed to be? Sorry Megan – I added it in today – thanks for the heads up?!?! Hi. You mentioned you left the tomatoes out. Can you specify that ingredient please? I’d love to add them! Thanks. Hi Lynda – This is the recipe I adapted: https://www.fivehearthome.com/slow-cooker-charro-beans/. They used a 15oz can of Rotel.